In your last post, you ended with a recommendation that teachers maintain a level of classroom chaos so that students didn’t know if they are slow or fast. Yes – I don’t emphasize speed in my assessment of a student, and I want to protect slow students from a negative assessment of themselves. Yes – it is not enough just to ignore the outstretched hand of the fast student and after 30 seconds ask a slower student for their answer. The victory of the slower student is already diminished by knowledge that another student was faster. Fast students get enough kudos – it is up to teachers to distribute some of those good feelings to the slow, methodical, thinkers. Give an example of how you would present a problem so that the slow students are unaware that they are slow. Okay, JUMPING FROGS is one of the first problems that I give to elementary school students. It’s a feel-good problem, because although it looks difficult, it is actually easy. My objective in presenting it is to give all students a success. On a hot summer day, five friendly frogs sit on their lily pads. Look! They have won the game because they’re all together! So the frogs have just solved the problem. I don’t understand how this helps bring chaos into the classroom. walk up to their table, add a lily pad and frog and walk away without acknowledging their success or giving them instructions what to do with the extra lily pad and frog. I often choose not to respond to their joy of solving the problem because I want to encourage students to find internal pride at solving it – rather than always seeking my endorsement. ask them to reproduce the result. Some students realize that writing down the solution is a good idea. I don’t prompt this, but if someone does start recording their results, I will later show their technique to the class. The labeling of the lily pads with letters is an example of an idea that came from a grade 4 class. The student thought that writing letters was easier than drawing arrows. 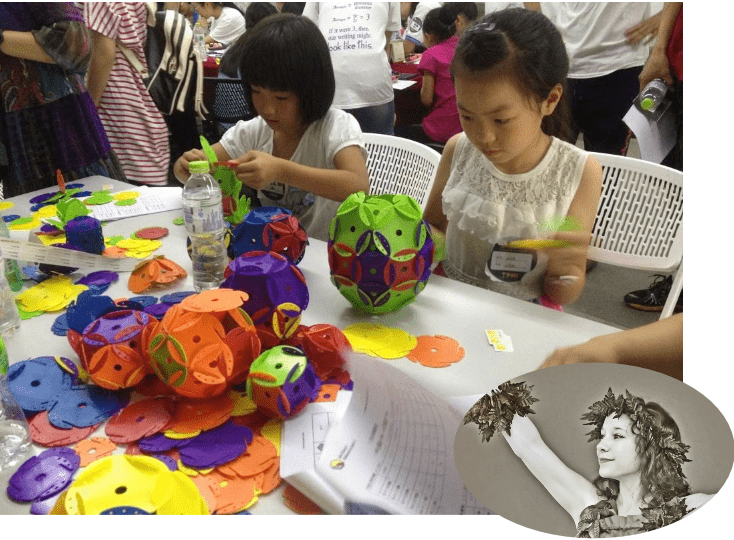 After some successes with 5-8 frogs students are encouraged to look for a general pattern, or I ask if they think that problem is solvable for a large number of frogs. There are lots of patterns. 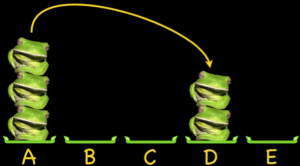 One pattern that students sometimes discover is this back-and-forth jumping that shows the problem is solvable for any number of frogs. Everything happens fast. There is often very little time to ask students to reproduce their solution (#2 above). This is not a relaxing mathematics class. The slow students are getting successes, but they still may be aware that they are slow. Let’s shake things up. We do this by assigning different goals. 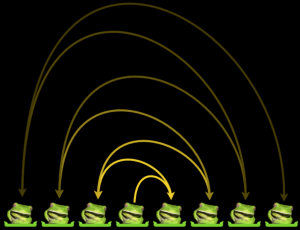 When a group gets to… say 10 lily pads / frogs, I might take five away and give them a magical lily pad where the stack of frogs must end up. 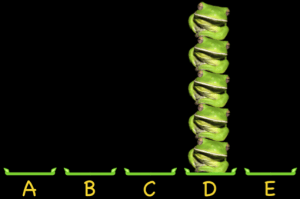 Is it possible that all the frogs can end up on B? Another group doesn’t get a magic lily pad, but gets a crown. 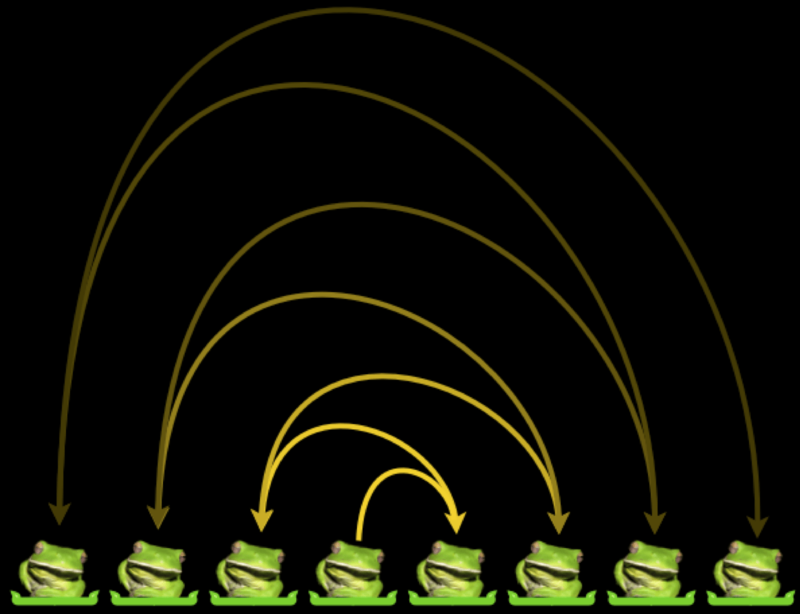 The royal frog who wears the crown must end up on top of the stack. Another group doesn’t get a magic lily pad or crown, but exchanges a bunch of their energetic frogs for lazy frogs who won’t jump unless someone is on their back. Is it possible to solve with energetic frogs only at A and H? Multiple goals like this help teachers get to a healthy level of classroom chaos, but afterwards I still bring everyone together to talk about their discoveries. There is a time for chaos, but also a time for order. Can you summarize the purpose of classroom chaos in one sentence. The purpose of classroom chaos is to give every student a success… a success not diminished because of comparison with their peers. This seems like it is more appropriate for elementary classrooms. Protecting slow, ponderous thinkers is valid K-12. Distracting students with a variety of goals is a strategy to achieve chaos. What would be an example of a teacher bringing chaos to a high school classroom? One way to introduce chaos in high school classrooms, is to introduce a problem that you are stumped by. This brings chaos, because the problem is obviously going to be pretty difficult, and the class will understand that there is no guarantee that any of them will solve it. …but it is actually liberating. The first time a teacher tries this technique, I encourage them to lie if they need the security, but I expect that they will become converts after seeing the student response.